February 2009 This sign appears every Friday at noon on the front door of a terrific falafel restaurant called Gyros House in the Habitat neighborhood. The proprietors are Muslims. I didn't know how good chickpeas can be but, more to the point, why would this restaurant close for lunch on a Friday? Anyway, can you figure out this sign? 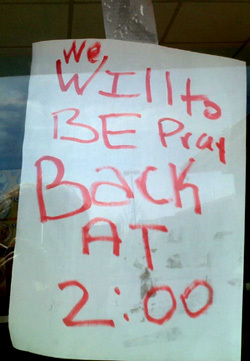 Read in the usual way it says "We will to be pray back at 2:00." But if you look again, you'll see that it's almost a palimpsest. The capital letters originally spell "WILL BE BACK AT 2:00." This makes sense as a sign that says you'll be back at 2:00 PM. But then someone added the words "We," "to," and "Pray." August 15, 2009 I took the picture below at a busy intersection just after lunch at the above-referenced Gyros House restaurant, so let me take you back to there. I had just finished a delicious gyros and as I was getting into my car I saw this truck in the parking lot. You will notice that neither the category of home repairs nor the category of lawn & garden has anything whatsoever to do with cutting or sewing or in any other way manipulating fabrics. Mr. Taylor does not purport in his signage to be any form of tailor, skilled or otherwise. 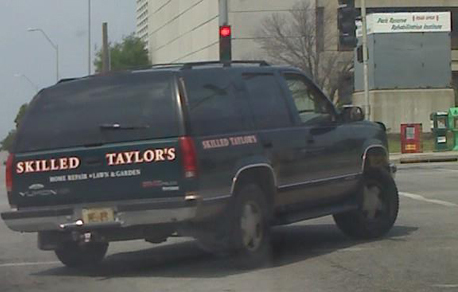 So I approached the woman in the passenger seat and asked whether she knew what "Skilled Taylor's" means. She took a moment and said her boyfriend's name is Taylor. I paused and then said, "Yes, and . . . ?" but she just stared at me as though that explained it. Mr. Taylor returned to the car at that moment and I asked him what his sign means. Here, as best I can remember it, is his explanation: His name is Taylor. He spells his name T-A-Y-L-O-R apostrophe S. No, wait, no apostrophe. No, wait, no S either. It's just Taylor's, OK? I said sure and told him I was going to take photos of the sign, and I flipped my phone open. He asked why and I said because his sign amused me. He didn't bother to ask why, but he did decide that he didn't want me to take a photograph of his sign. Now, you understand that this is a sign (three actually) that he must have paid a fair amount of money for, presumably for the purpose of advertising his home repair and lawn services, the name of which is Skilled Taylor's. You've got to figure he wants people to see the sign as he's driving around town or parked at a customer's house. (Also, wouldn't you have spent a few extra bucks and added a phone number or an address or a URL or something?) Yet now he doesn't want anyone to photograph the sign he paid good money to be seen by as many people as possible as often as possible. He said he didn't give me permission to take photos. I said his truck was in public view, and I asked whether he wanted the URL of the page where I'd publish the picture. I got set up at the right rear and he then interposed himself between me and the truck to block his sign! I walked to my right to get a shot of the right side of the truck and he jumped to his left so I again I had no shot. I danced him back and forth once more and then realized he had the advantage because of the smaller subtended angle. So I set up to the right of the truck just behind the rear bumper and pretended I was aiming at the sign on the right side. He took the bait and moved to this left, at which point I switched quickly to the sign on the back and got a shot. Unfortunately he was too quick and, although he managed to get there fast enough this time, he also realized he was going to lose this new game pretty soon. He called out to the woman in the passenger seat to get in the driver's seat and drive off without him. Obviously he couldn't hop in without giving me an unobstructed view, and this is becoming comical to me, as I think it would anyone. I should point out now that the woman had been cradling an infant in her left arm (with a cigarette in her right hand that was maybe six inches from the kid's face). In the time it took her to get that truck out of there she not only didn't have time to place the child in an infant seat, she didn't have time to do anything with it except leave it on the front seat. The truck roars off and makes a left, and I figure this is over, so I get in my car and drive off to go back to whomping nails on a Habitat house. But I happen to see that the woman drove way too far away, and she's on a one-way street, and Mr. Taylor has a long way to go to catch up, so I realize maybe I have time to get a good photo after all. I pull a quick U-turn and head back. They must have been watching for me, because as soon as I turn north onto Locust they peel out, with Mr. Taylor's back in the driver's seat. They're a long block away and I admit I might have driven a bit over the speed limit trying to catch up, but I think being predator arouses almost as much adrenaline as being prey. They turn west onto 31st Street, and if the traffic is against me I'll probably lose them. But just as I get to 31st the traffic clears and I see that my quarry, my prey, has been stymied by a red light. He's in the center lane, so he must go straight through the intersection, and I prepare my cell camera again. I pull up at rather a high speed and hit the brakes at the last moment so as to get stopped quickly behind them. And just as I do Mr. Taylor's decides his best move is to bolt the light and turn right across the right-turn-only lane. It was at this moment I took the picture above. I follow him north, and two blocks later I see he had already done his own U-ey and is now going south. I lose interest in the pursuit since I have my photo, and as we pass I give him the OK sign, which was the best sign I could think of to express the idea that I'd bagged my game. If you were Mr. and Mrs. Taylor's, would you race home -- making sure there's no tail, of course -- and immediately set about spray-painting the signs away? More interestingly, if you were Mr. or Mrs. Taylor's, how would you tell this story? Anyway, no matter what, SKILLED TAYLOR'S is another sign in the Habitat neighborhood I do not understand.